What Do The Colors Mean in Sisu? The color scheme in Sisu is meant to show you how "hot" or "cold" you are in reference to your goals. Warm colors (orange and yellow) mean you're tracking well. Blue means you're falling behind. 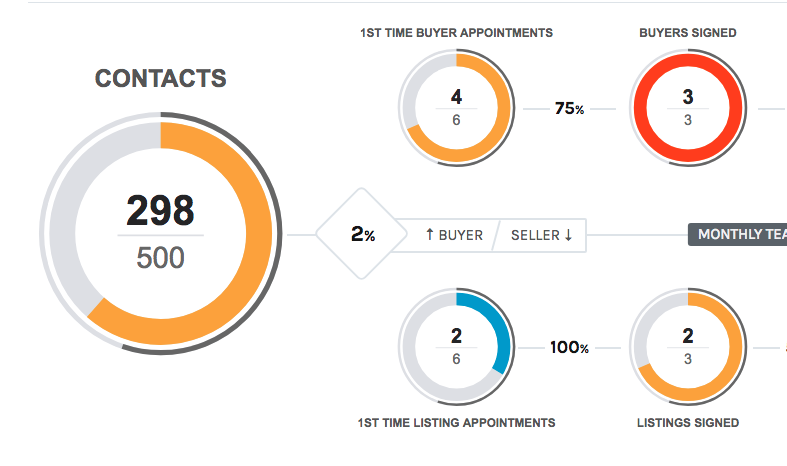 This agent is pacing well for contacts, listings, and 1st time buyer appointments. They've already hit their goal for buyers signed... Awesome! They're falling behind on listing appointments, but luckily, there's still plenty of time to catch up! 👍🏼 A team leader could help by coaching the agent on their contacting strategy for listings.